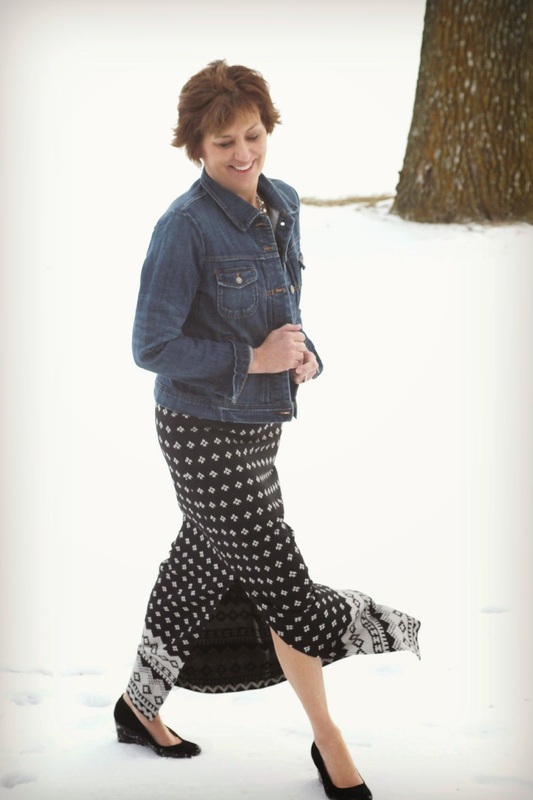 Oh, the maxi skirt, where have you been all my life? I do love this look but needed a dressier maxi in my closet and in my wardrobe. Enter this fabulous Mood Fabrics' Italian Marc Jacobs Border Print and the idea of a straight maxi with a nice side slit. 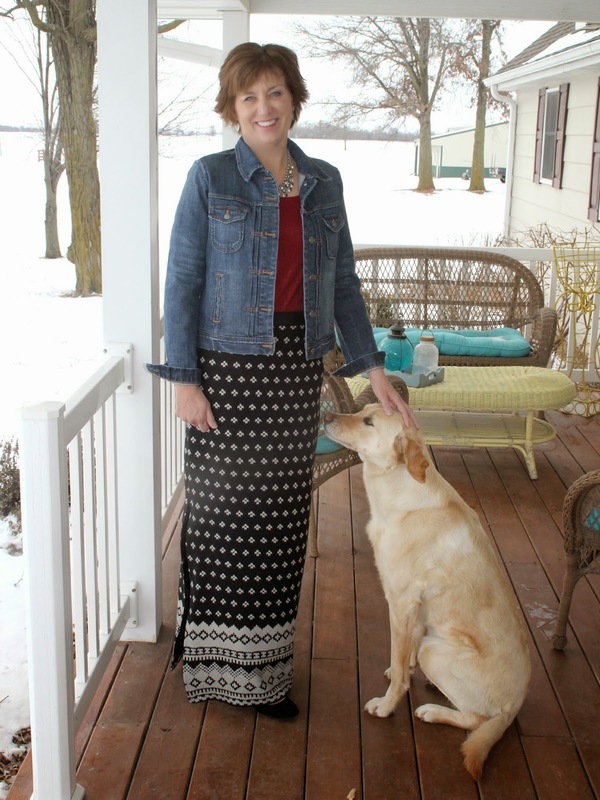 For my pattern, I went with McCall's 6755 and if you check out that pattern it looks nothing like my skirt. The McCall's pattern has a curved piece front and back, which I did not want or need for my skirt. I just pinned all the pieces together, overlapping seam allowances and had one front and back piece. I did take special care to match the border print on the side seams for a clean look. What isn't there to love about a border print and this fabric has such a graphic bold look which makes my skirt pop. Do you ever get that happy accident? I did for this skirt, with the match of the pattern. I ordered 2 yards of this border fabric and it was just enough to make this skirt, so I was only concentrating on making the lines match horizontally. Take a look at my happy accident. there is a seam in the photo. Can you remember one of your happy accidents? Don't they just bring a smile to your face? I did some fitting with this skirt before I attached the waistband. With this initial fitting, I did find skirt to hit very high on the waist. So high, in fact, I had to take off 2" from the top of the skirt to get it to a comfortable point on my waist. Also, I eliminated the front darts, I just don't have that much waist curve and the back darts were just perfect for the curve of my derriere! I stitched the slit side seam to the point I thought would be enough for walking ease. I underestimated the walking ease and had to lengthen the side slit by a few inches. 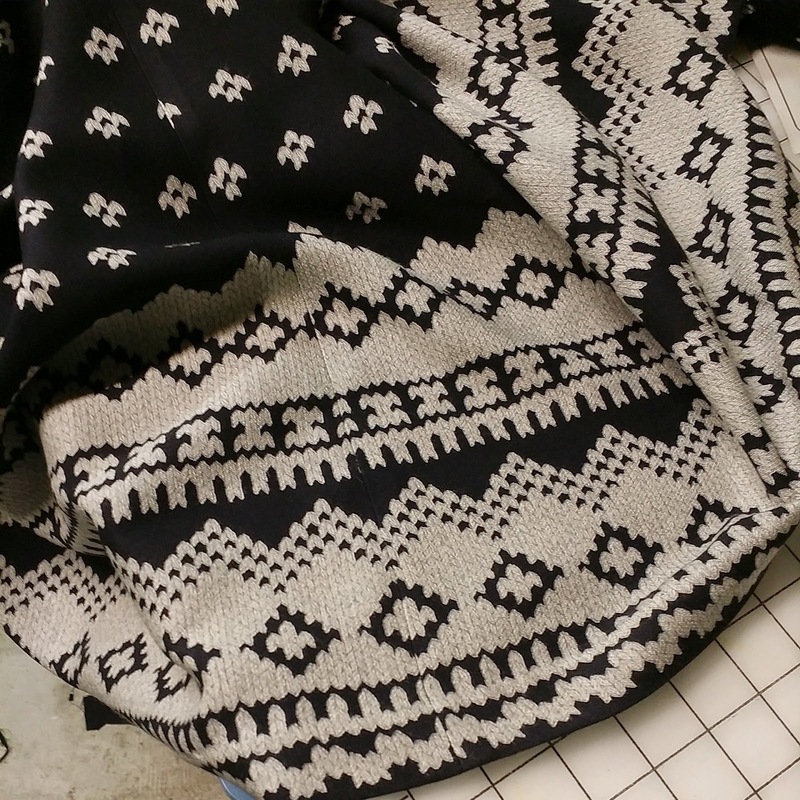 I did not line this skirt at all, the wool is not scratchy at all plus the wrong side of the skirt is black which looks fine peaking through the slit. 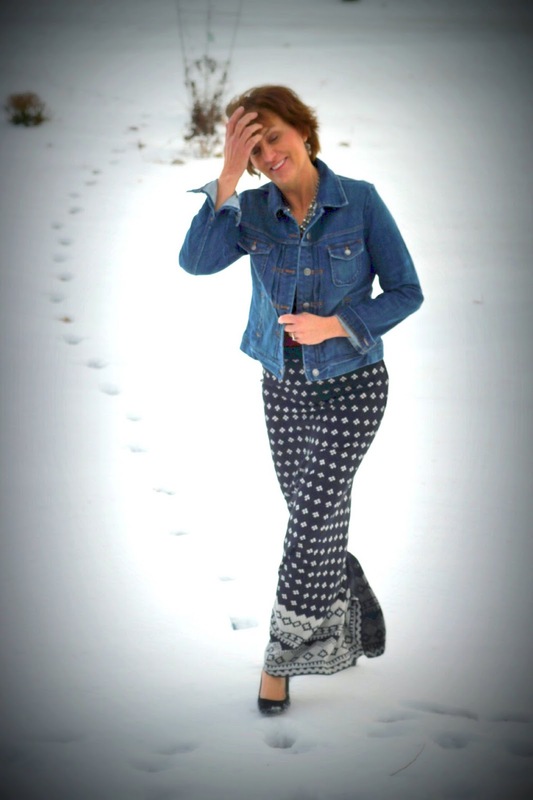 Plus most days, I won't be walking through the snow in 16 degree weather with 20 mph wind gusts blowing my skirt all around! For the waistband, I used a solid black portion of the yardage. My thought process for this was the black would make the waist look smaller and break up the print a bit. I did interface the waistband and add a skirt hook closure. 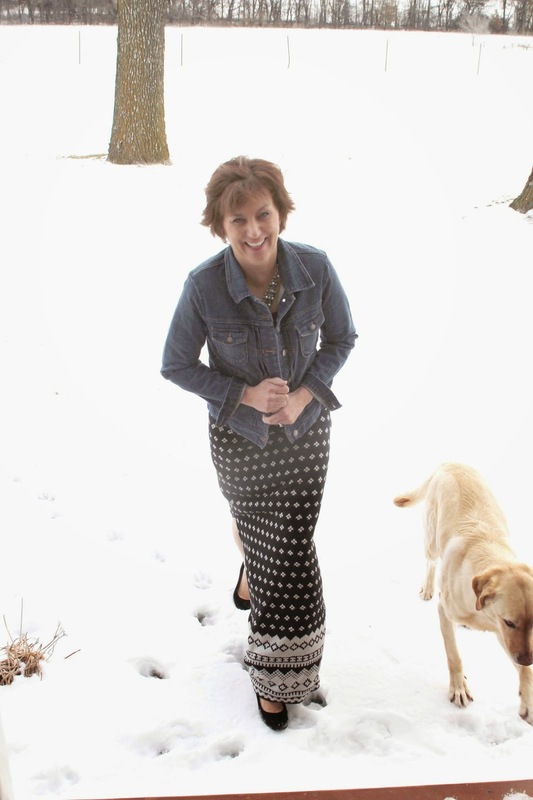 My new maxi skirt is perfect for my wardrobe, I think it will work from casual to dressier occasions and it will transition from this cold winter weather to spring and summer just fine. Even though there is some wool in this fabric, it is a lighter weight with nice drape and will really work for all temperatures. Nice Skirt! I love that border print. Thanks, Rose, it is a great fabric and print. You did a great job working with the border print. What a great piece for your wardrobe. Thanks, Dharma, I think it will be fun to wear. I am trying to get smarter, keeping black in my wardrobe but trying to limit it around my face. Black just brings out the black circles! Thanks, Stacy it was such a surprise when I went to press. Very pretty skirt! And you are so brave to go out in the snow for your photos. Thanks, Ann, I really don't get any good light in the house during the winter. Beautiful skirt! It was difficult to find the seam...wow...a perfect match like that rarely happens! 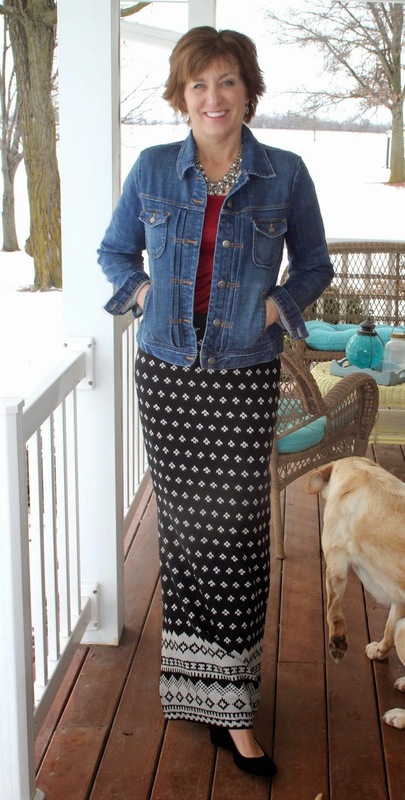 Great looking skirt, love the fabric you chose. A beautiful skirt - the fabric really makes it! Thanks, Sham, you are right the fabric makes it.